Have you considered the benefits of a Sweeper Machine? Home > News > News > Have you considered the benefits of a Sweeper Machine? News: Have you considered the benefits of a Sweeper Machine? Have you thought about how much a sweeping machine could benefit you? Are you currently using a broom or perhaps not pre-sweeping at all? It is worth considering that a broom can actually create more dust, is incredibly time consuming, not to mention back breaking work! A sweeper can capture dust and debris in a single pass. It is easy to sweep quickly and uniformly. 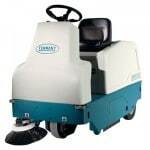 These considerations ensure that you are getting the most cost effective cleaning possible, especially when you add to this that a ride on sweeper can clean large areas in a fast, efficient manner. If you pre-sweep the area before using your scrubber dryer it will enable your scrubber dryer to work more efficiently. There will be less chance of any damage being caused to your scrubber dryer. Common damage caused to your scrubber dryer by not pre-sweeping can be that debris causes a blockage in part of the machine or that squeegee blades become damaged due to grit wearing them. Additionally if the blades are not clean they can create streaks across the area being cleaned, meaning you may need to clean the area again! Having seen what the benefits of using a sweeper can be why not view our current promotion of “Sweep Past Go” to see how you can take advantage.